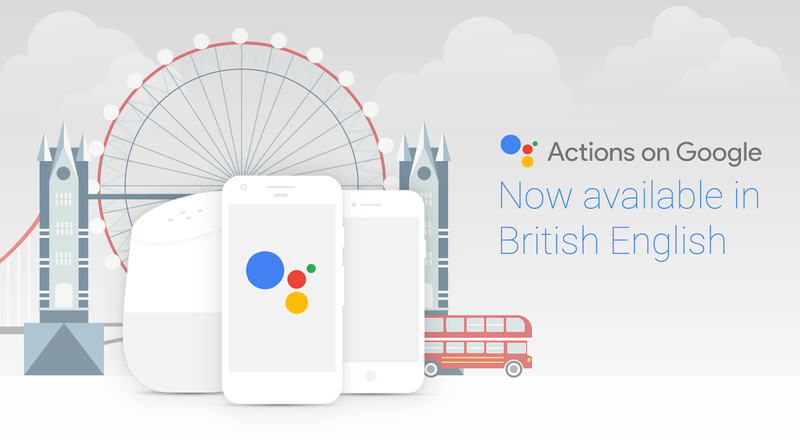 Starting today, we're making all your apps built for the Google Assistant available to our en-GB users across Google Home (recently launched in the UK), select Android phones and the iPhone. There are four new TTS voices with an en-GB accent. We've automatically selected one for your app but you can change the selected voice or opt to use your current en-US TTS voice by going to the actions console. We also recommend reviewing all your response text strings and making adjustments to accommodate for differences between the two languages -- e.g., these pesky little Zeds. This will help make your app shine when accessed on the phone. Apps like Akinator, Blinkist Minute and SongPop have already optimized their experience for en-GB Assistant users—and we can't wait to see who dives in next! And for those of you who are excited about the ability to target Google Assistant users on en-GB, now it is the perfect time to start building. Our developer tools, documentation and simulator have all been updated to make it easy for you to create, test and deploy your first app. We'll continue to make the Actions on Google platform available in more languages over the coming year. If you have questions about internationalization, please reach out to us on Stackoverflow and Google+.